My roommate is the one who first introduced me to the delicious world of shrimp tacos. 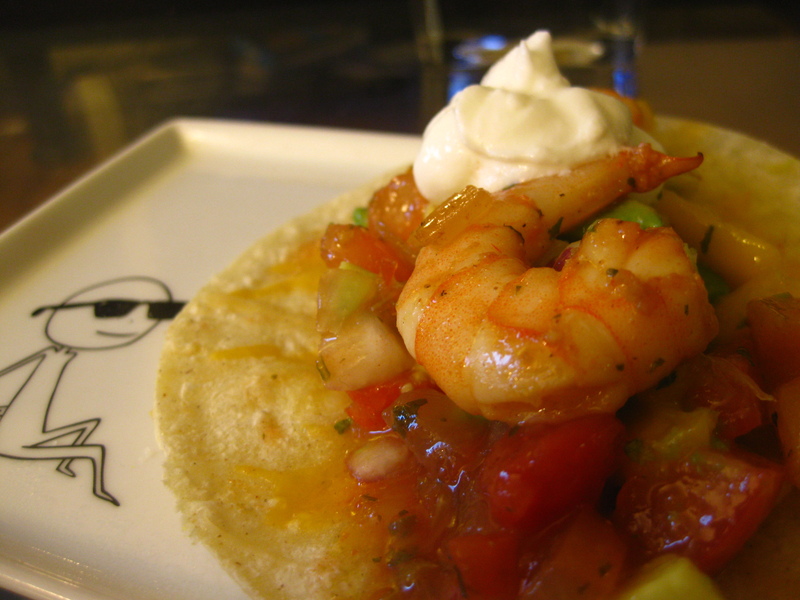 We typically would throw together some cooked shrimp, guacamole, salsa, cheese, and sour cream in a soft tortilla and happily eat away. I was looking for a way to jazz up the recipe and found several recipes incorporating mango salsa. I absolutely adore mangoes and I had been wanting to make my own mango salsa for a while now. I took bits and pieces of various recipes found on the internet and came up with the results below. I loved the refreshing flavors of the mango salsa with the spicy shrimp all wrapped in a warm tortilla sprinkled with melted cheese. When I seasoned the shrimp, I just experimented with various proportions according to taste so I don’t really know the exact measurements. However, everyone enjoys a different level of spiciness so go with whatever your taste buds tell you to do! It is important to give the shrimp some heat, so it doesn’t get overpowered by the refreshing citrus flavors of the mango salsa. 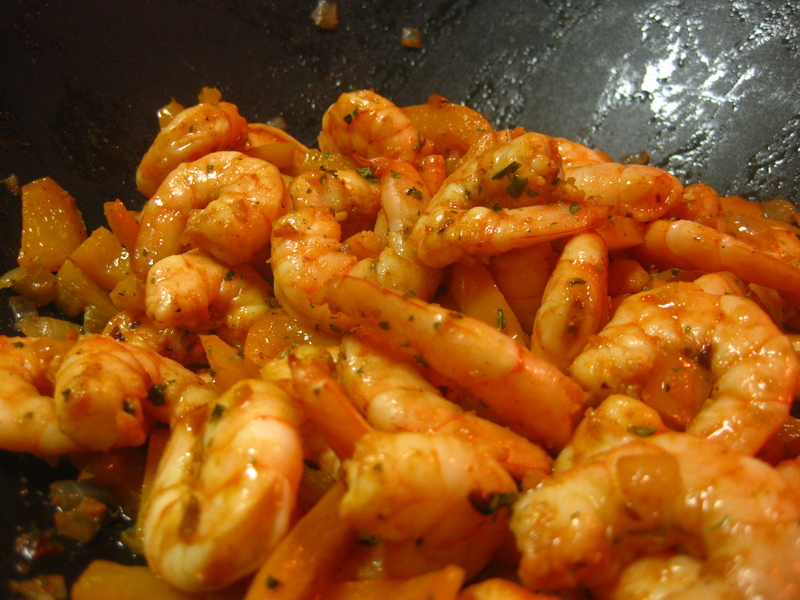 Season the shrimp with lime juice, black pepper, salt, crushed red pepper flakes, lemon peel, and 1/2 packet of Sazon Goya seasoning and set aside. Heat the butter/margarine and olive oil in a wok/large skillet over medium heat. Add the garlic, onion, bell pepper and sauté until onion is translucent. Add the shrimp and sauté until pink. Feel free to throw in more seasoning depending on your spiciness desires. Turn off the heat, and sprinkle the parsley on top. Take a corn tortilla and sprinkle some Mexican cheese on top. Place in the microwave on high for 10 secinds until cheese is melted. 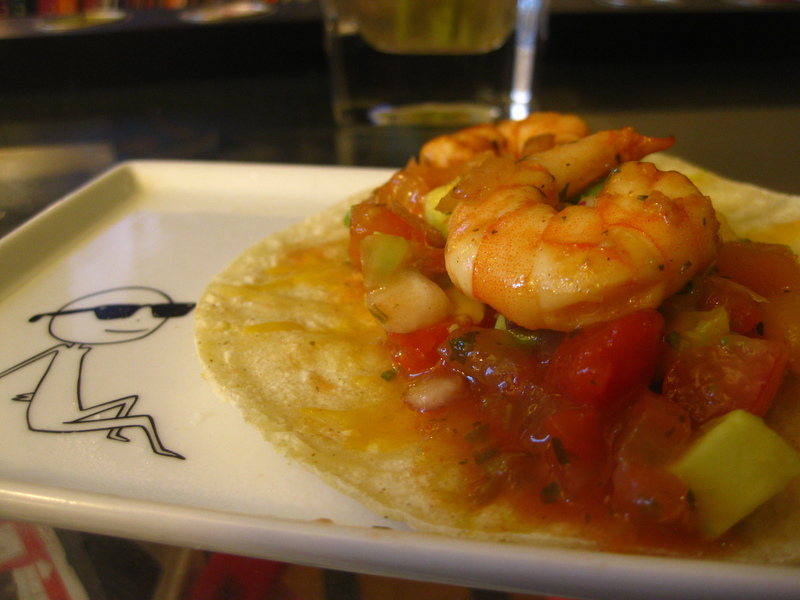 Spoon some mango salsa and shrimp on the tortilla. Top with a dollop of sour cream and enjoy!